Hi everyone! 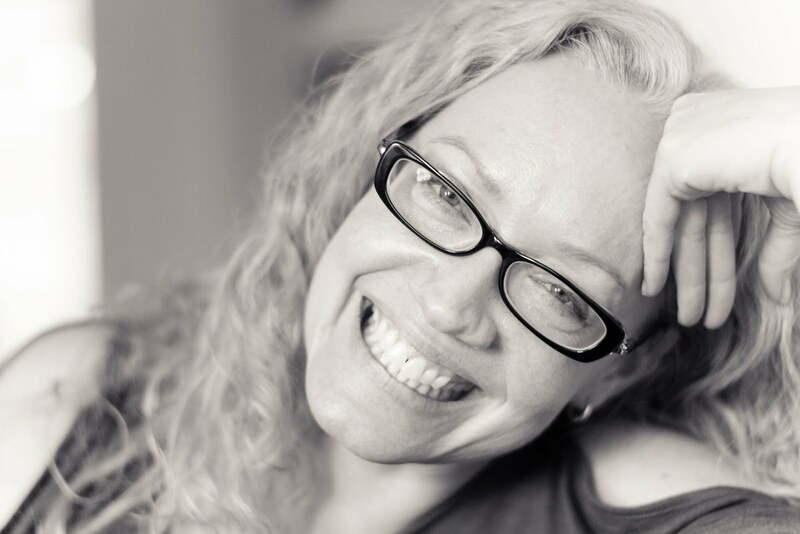 Yes, I'm still alive even though my blog has been very quiet - a new job and life-in-general will do that. Anyway, it feels like fall in Chicago and my daughter's mind is already on Halloween and holidays in general. So I was inspired to pull together a thoroughly bookish holiday post. The goal: Everything holiday, by the book! 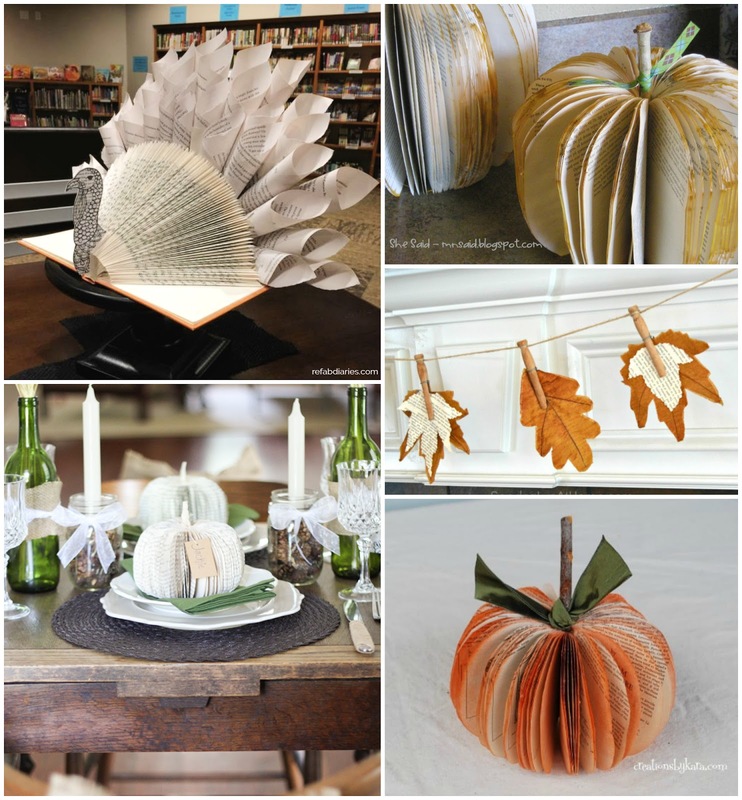 Halloween costumes, Thanksgiving decor, and all December decorating and giving... using old books and book pages. Doable? Yes! Ready? Here we go. 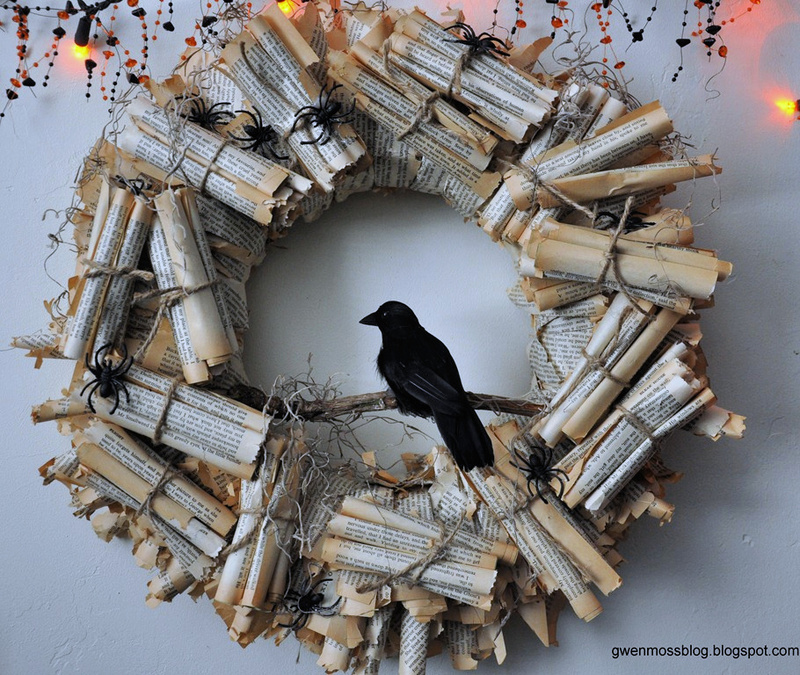 I'm not a big wreath person but holy Poe, this Raven-inspired thing is cool! All the instructions here. 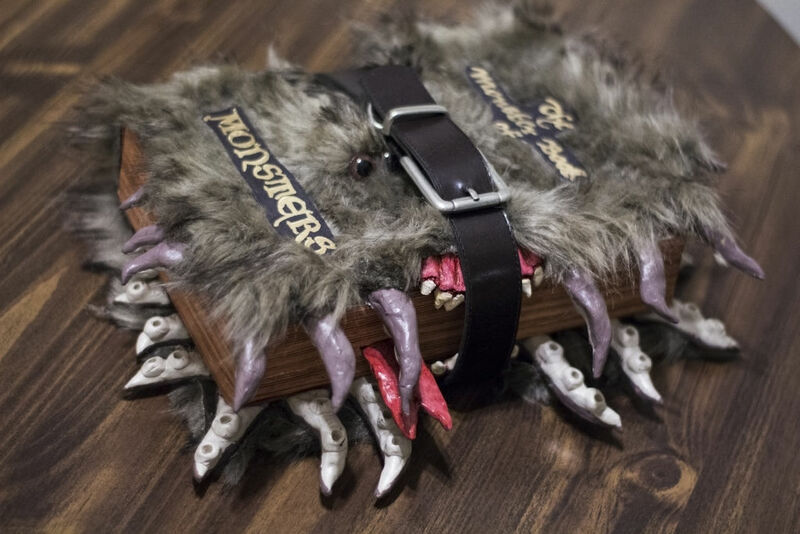 For all you muggles, you know you want to make the Monster Book of Monsters, right? Yes - it does involve upcycling an actual book, otherwise it wouldn't here (an old dictionary to be precise). So here's the full Instructable. 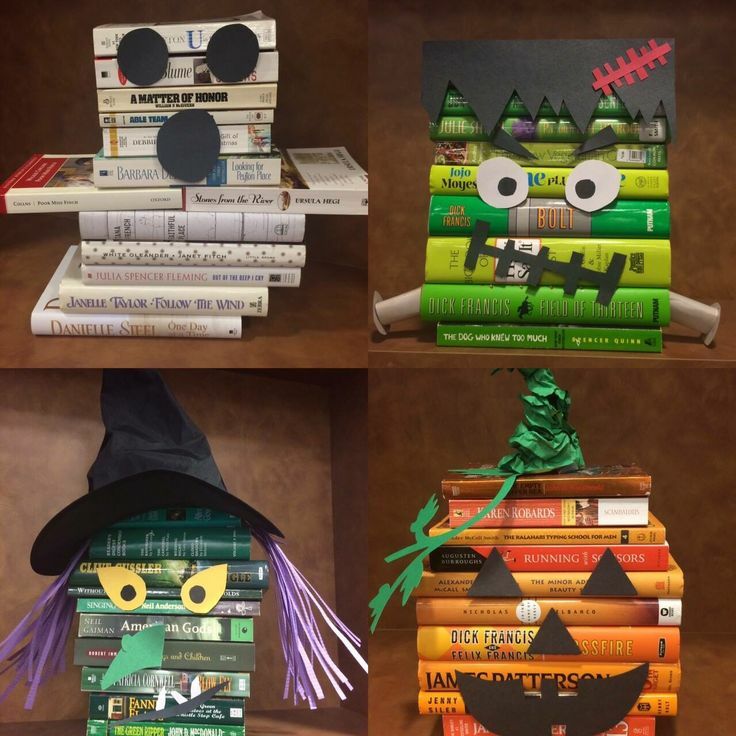 Do you feel the need to dress your books for Halloween? Oh good, then this one is for you. Once again, no original source on Pinterest. Sigh. Hardly needs detailed instructions though. Perhaps you also want to dress a person? Like, your daughter? This diction-fairy will forever be a fave! Not sure anyone has ever tracked down the original instructions (correct me in the comments if I'm wrong!) but hop over here for the most popular how to. For more inspiration, I LOVE this! 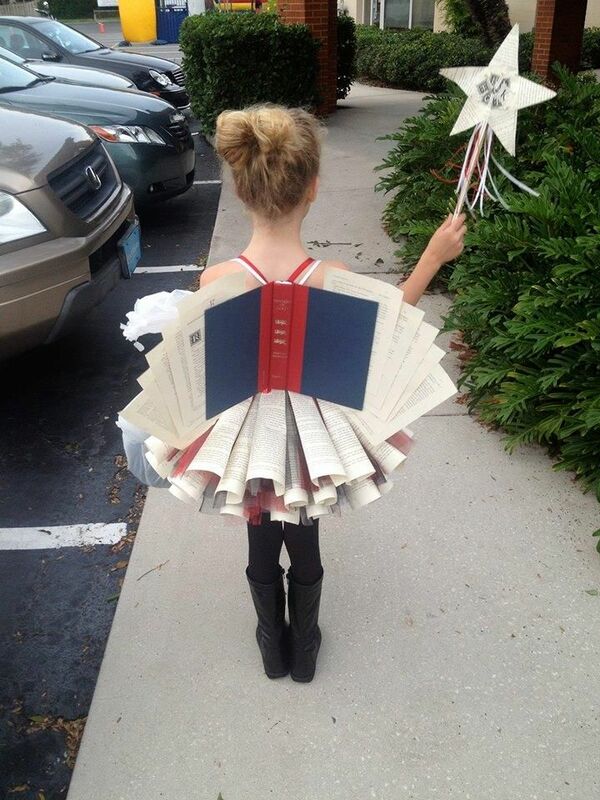 And for grown-up book lovers, you have to hop over to The Story Sanctuary and look at all the details that went into this Steampunk Book Fairy costume! Ok, getting sentimental for a second. But here's the truth: I'm beyond thankful for books. For some obvious reason... but in this context: my love of books and reading landed me my first post-grad job in the US (as a reading teacher, circa 2003). The people that are now my nearest and dearest in this strangest of not-so-united states are people I met through that job. Fellow readers, book lovers and word-nerds. Who are also amazing writers, teachers, photographers, comedians, film makers etc. Moral of the story: if you love books, find other people who do too. They are the best. Below is a throwback to a book-inspired Friendsgiving ... attended by an important handful of these people, but not even close to everyone who inspired it. I didn't make pumpkins or a turkey for my bookish Thanksgiving. Wish I had, and thankful I can send you to actual instructions for this lot! Find instructions for the pumpkins here, here and here. 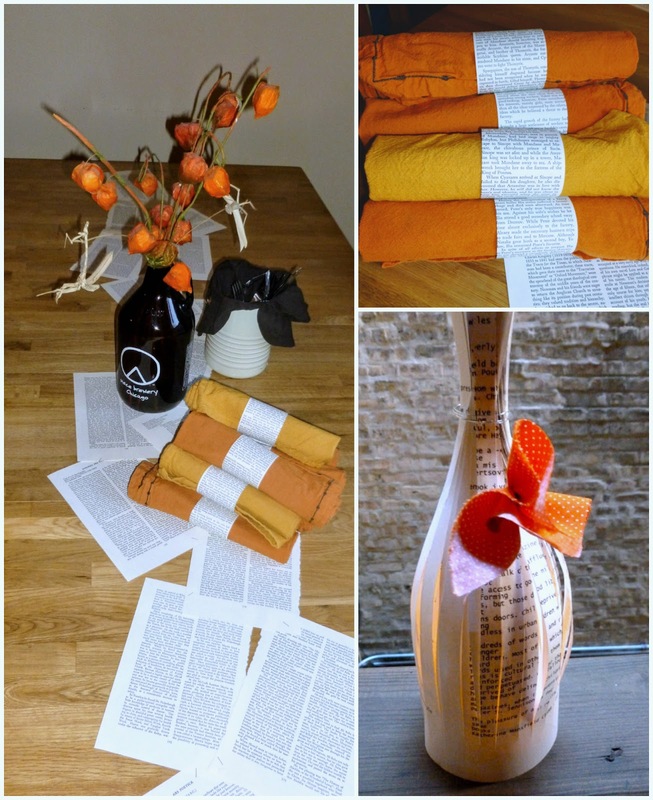 For the how-to on the bookish leaf banner, go here. The extraordinary turkey looks tricky right? Not so. 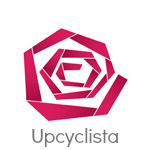 Go here for a great video tutorial. I love the many ways we celebrate the end of one year and the beginning of the next. It feels especially meaningful to me now that I live in the northern hemisphere - lighting up winter just makes sense. However you do your celebrating, I hope you can find something inspiring in this mix! I'm a tree person. But I doggedly refuse to have a real tree! Chicago has become much better about recycling trees but... I guess I just don't love cutting down a tree simply to decorate a home for a month. So I have a little wire tree that was made in South Africa, and I put up lots of other decorations around my home. If you want to get really bookish, here are the sources for what I've collected above! 1. 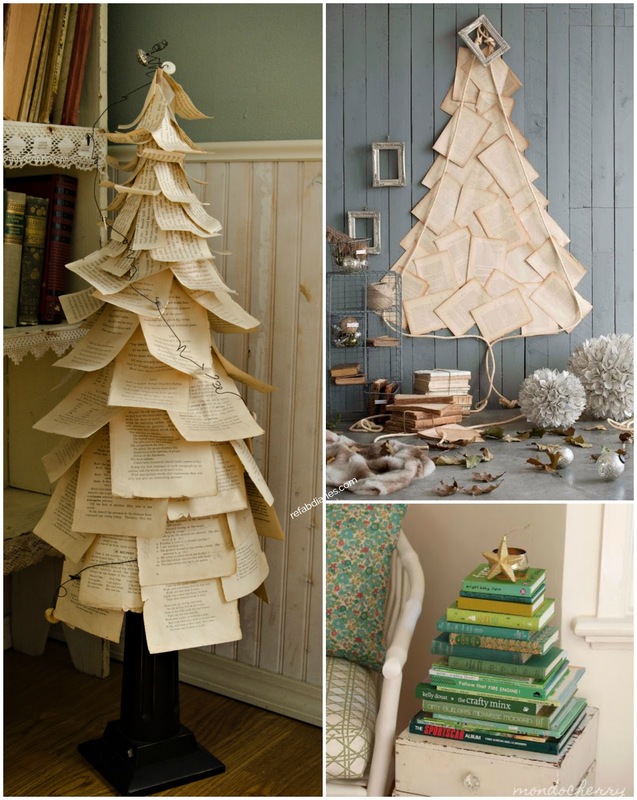 Use book pages to create a tree on the wall. 2. Curl some old pages and voila, a lovely, literary tree. 3. Get your kids to stack green books from large to small and pop a star on top - that should make them smile. 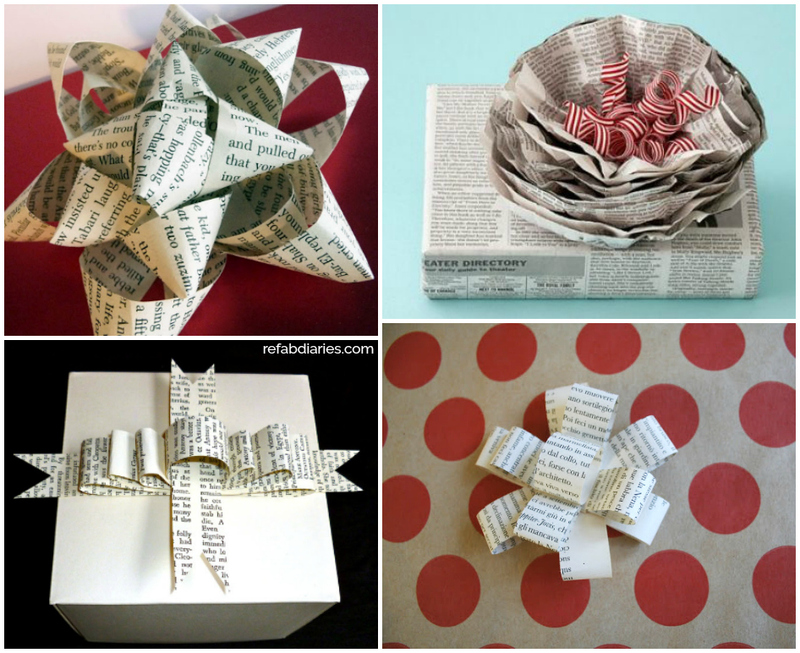 Trees or no trees, there are lots of ways you can enjoy book-page ornaments! 1. 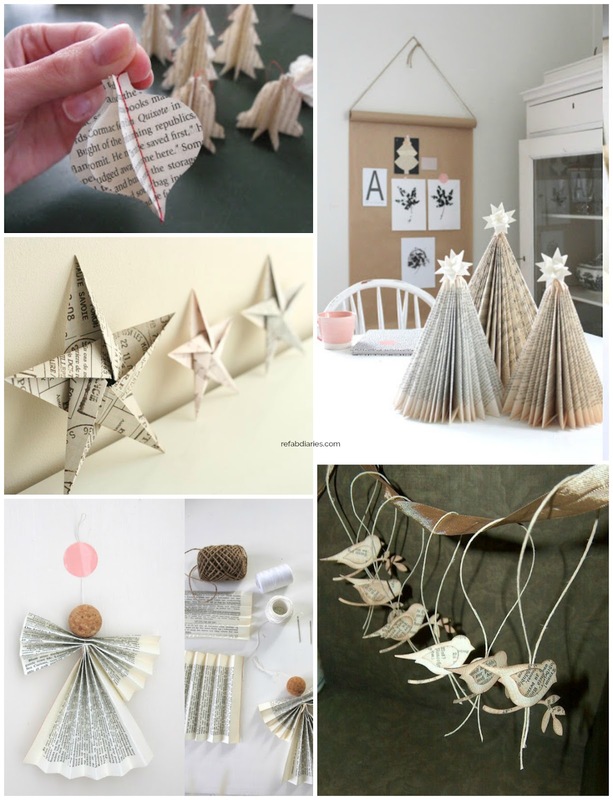 A variety of stitched-paper ornaments by Darling Petunia. 3. No source for these particular sweet paper birds (Pinterest strikes again), but an alternate tutorial here. 5. Two sources for these stars. Here and here. 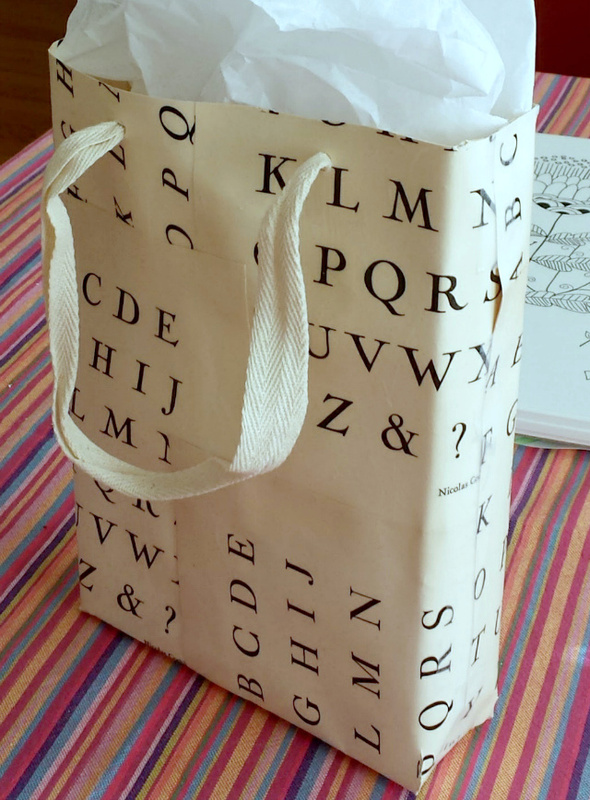 Whether or not you're giving books as gifts, making custom gift bags with old book pages is fun. And easy. Instructions here. 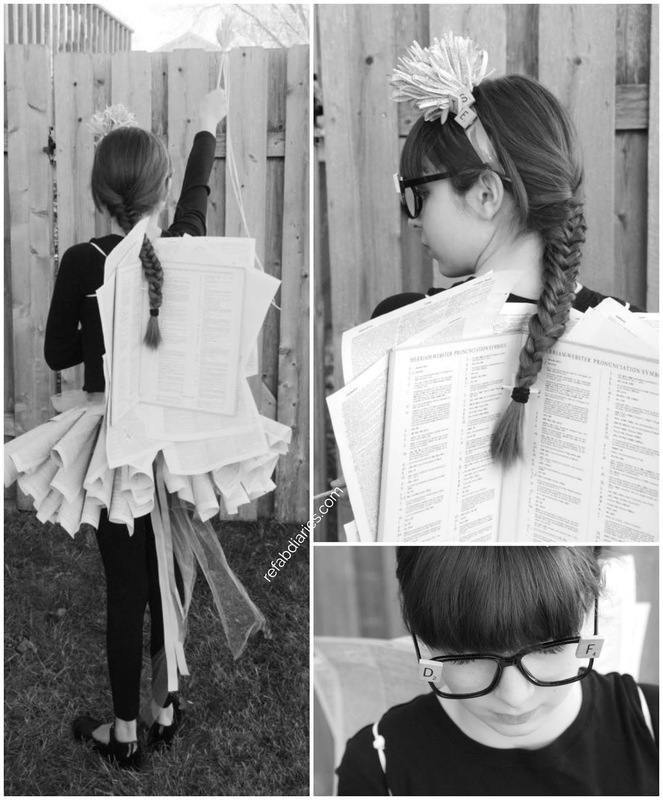 You can also just embellish with book pages! And finally - gifts made from upcycled books. 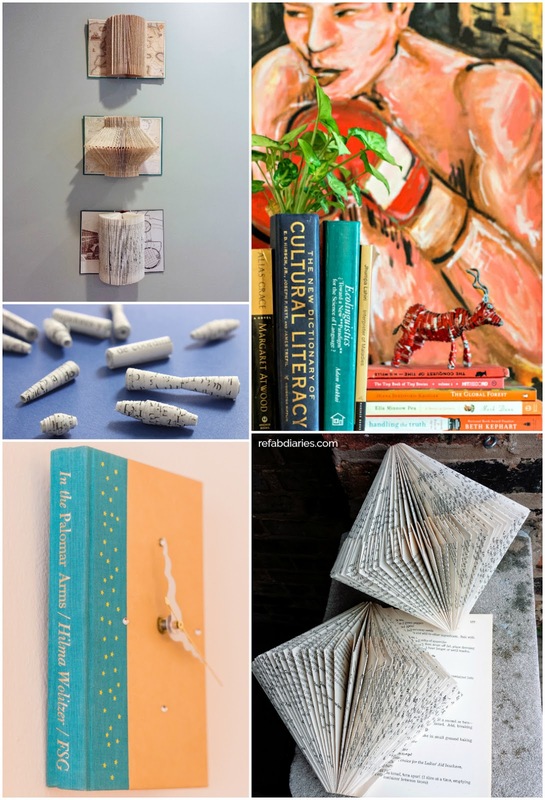 They're easy DIYs, don't cost that much (time or money), give a new life to a book that's being thrown out and make meaningful, unique gifts for book lovers. Or friends who know that you're a book lover! 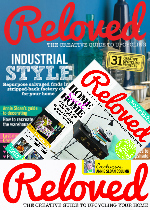 Sidenote: if you're worried about upcycling books, please read this. 2. A book planter. It can also be used as a vase and is much easier to make than you'd think. 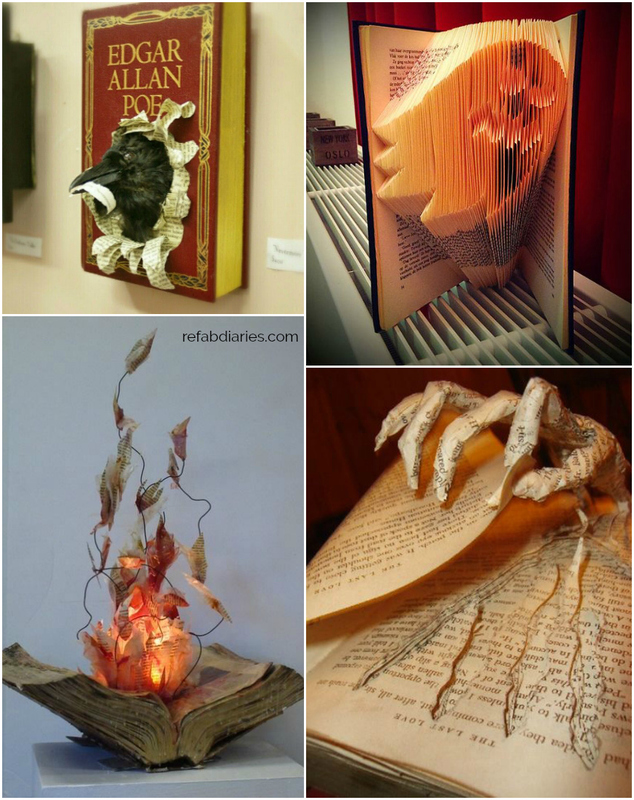 This is a great way to repurpose an outdated reference book. 3. A book clock. This is an elegant way to re-use a book with a beautiful hardback cover (and junky content). I'm always drawn to unusual colors and quirky titles. 4. Use book pages to roll your own beads and make simple bookmarks.